The fifth Vice President of the United States, and 9th Governor of Massachusetts - Elbridge Gerry - has not been forgotten. His name lives on in debates about the shapes of political districts and specifically in relation to those very irregularly shaped Congressional Districts we often see in the United States. Thus, gerrymandering remains a hot topic, but it is often difficult to understand without maps. 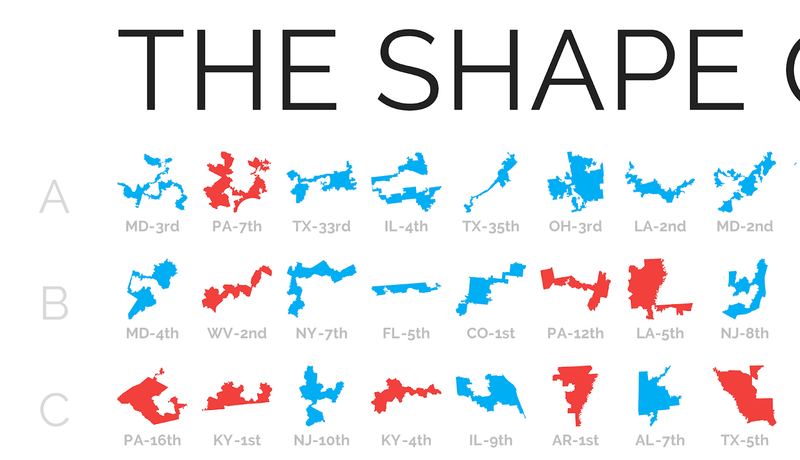 So, in an effort to simplify things, I've created a single graphic that shows the shape of every US Congressional District - or, as I've called it, 'The Shape of American Democracy'. I have put the massive full size version, plus smaller versions, on a dedicated web page, which I may update in due course. Read on for more details about this project. 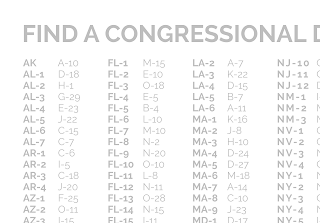 The graphic above is a single poster that shows all 435 US Congressional Districts of the 115th US Congress, arranged in 15 rows and 29 columns. This is quite convenient, because 15 x 29 is 435, so it allows for a nice, regular layout. 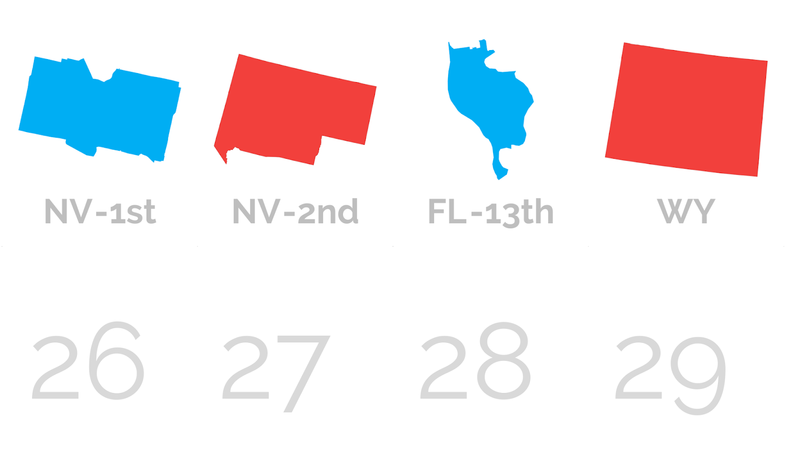 The colours (sorry, colors), represent the party representing each district - blue for Democratic, red for Republican. The order of the shapes is also very important. From top left to bottom right, I have arranged the districts in order of their Polsby-Popper score, which is one measure of the compactness of a geographic area, among several. There are others, but I've used this one as I think it provides results that make sense and look right. 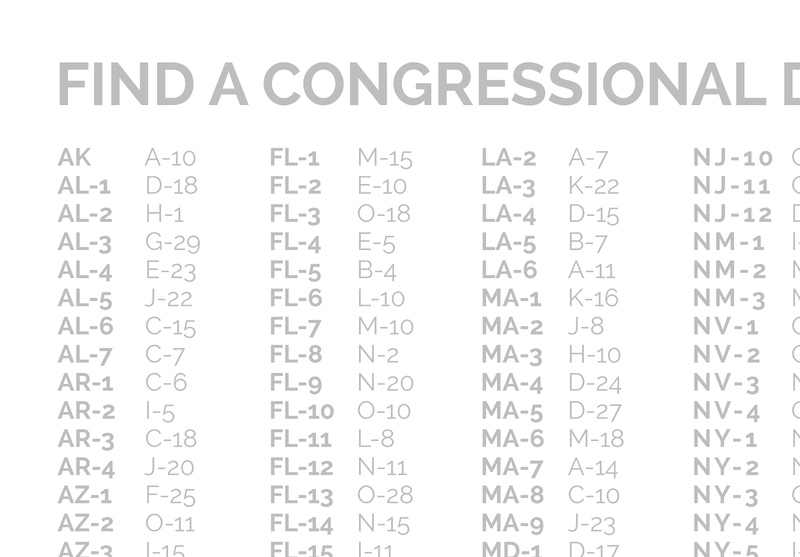 On the right hand side, there is a list, in five columns of 87 rows (5 x 87 = 435, thankfully), which tells you where you can find any Congressional District in the main layout, where I have labelled the rows A to O and the columns 1 to 29. 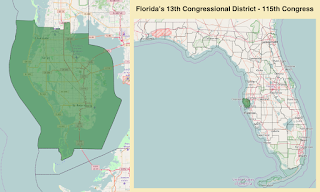 So, if you wanted to find Florida's 18th Congressional District, for example, you would look it up alphabetically on the right, see that it's in N-23 and then look up row N, column 23 to see what it looks like, as shown below. 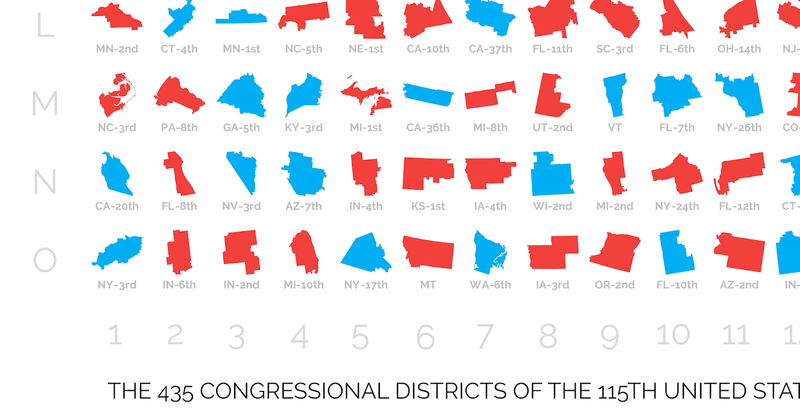 If you look closely, you'll notice that some Congressional Districts are actually whole states. This is because seven states have only one representative: Alaska, Delaware, Montana, North Dakota, South Dakota, Vermont, and Wyoming. The reason I did this is because I'm interested in the subject and have written about it before. I lived in the US for a short time (OH-3) but I'm not an American and I have no vote. I do have an unhealthy interest in maps and stats, though, as you can see if you look at more of this blog. In previous attempts, I'd done things like make small multiple graphics or animated gifs, but I wasn't satisfied with them. 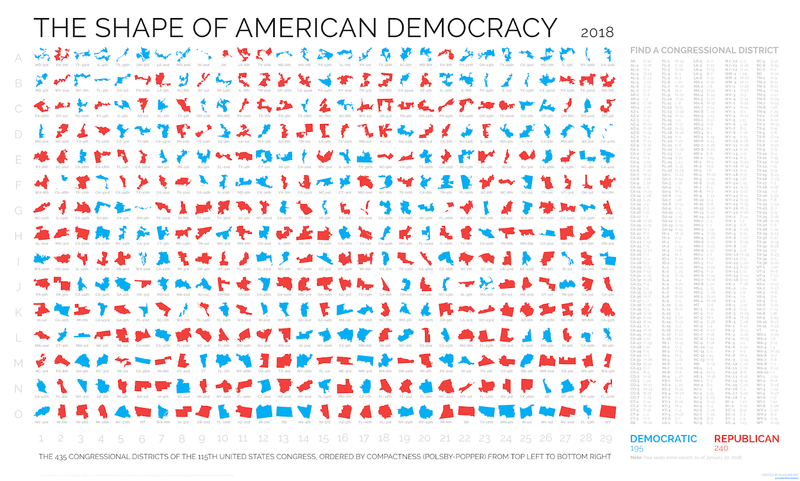 This time I wanted to pack as much useful information into a single graphic as possible, yet I also wanted it to be easy to digest, and The Shape of American Democracy is the result. I'm reasonably happy with it as a first draft, yet almost as soon as I finished, Pennsylvania redrew its districts after the existing ones were struck down by their Supreme Court. I am definitely not doing this to say any single political party is bad or good, or that an irregular shape is necessarily a problem. But by putting them all in one place, where we can also compare and contrast individual districts, I think it gives us a good overview and is a useful conversation starter at the very least. Let's begin with the basics. It tells us that there are 435 Congressional Districts and that some are red and some are blue. By using the Polsby-Popper measure (which I learned about from my colleague Ruth Hamilton), and ordering them like as I have, it also tells us that some areas are much more irregularly-shaped than others. But of course we already knew this information. Where I think a graphic like this adds value is in its ability to pull all this information together into one information set that is, from a cognitive point of view, easier to digest. It provides a kind of at-a-glance summary of US Congressional District irregularity. This is not to say unusual shapes are inherently a bad thing because there may be good reasons for it. Likewise, more regular shapes may not necessarily be a good thing even if, on balance, most people would agree that this is the case. For more on this general topic, I recommend you read Garrett Dash Nelson's piece in Citylab, which asks the question of what a good electoral map would look like. In brief, I downloaded the latest US Congressional District shapefile from the US Census Bureau website, loaded it up in QGIS and then created an Atlas and then patched it all together in another open source application, called (ahem) GIMP. Creating the Congressional District finder table was a bit more tricky, so for that I used spreadsheets and pivot tables because it was the quickest way I could think of doing it, even if it was a wee bit clunky. I then exported different sizes of the graphic and put it all online in a dedicated single web page. Am I saying US Democracy is in bad shape? I realise the title of the graphic makes it sound that way, but it's not my intention. 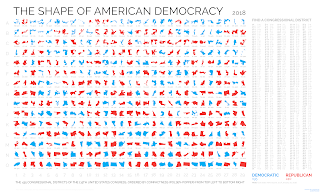 This is about shapes, and I toyed with the idea of calling it 'The Shapes of American Democracy' but in the end I went with Shape because I thought it sounded better and of course people can make their own minds up about what this might tell them about the state of democracy, if anything. Being from the UK (as a Scot living in England) it would be quite rich for me to criticise anyone else's democracy at present anyway! 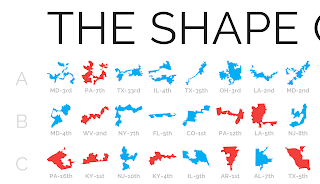 So, all I'm really saying is that the graphic gives you an impression of the shapes of US Congressional Districts, which form part of the democratic process in the United States, and from that you can make up your own mind about what it all means. I originally put this together as a submission for the brilliant Atlas of Design, but it didn't make the cut, so I'm sharing it here instead, and on its own dedicated web page. I made it in January 2018, but then almost straight away the Pennsylvania Congressional Districts were re-drawn, but it still represents the correct information at a moment in time. I could update it if a) I ever find the time or b) someone commissions me to do it. So, that's already two kinds of fails with this project, but I think it is still useful to share it. That's basically it for now. I haven't been able to obtain the very latest boundaries in the wake of the Pennsylvania re-draw but I might return to this in future if I can to create a version 1.1. When calculating the shapes of Congressional Districts, and their irregularity, there are a number of technical challenges, not least of which is the coastline. 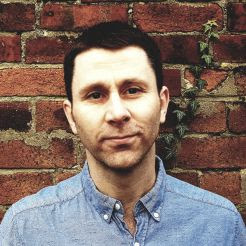 What we really want to measure are only those boundaries that can or have been manipulated by people rather than nature. 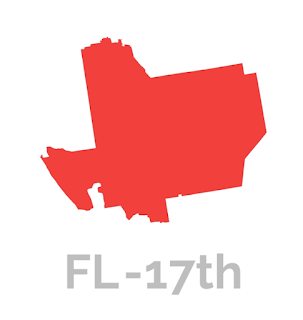 A heavily indented coastline will give a district a very irregular shape, but this is not gerrymandering. So, when I was doing this I used an unclipped shapefile with, essentially, a smoothed coastline. Yet even when you do this you get some anomalies - e.g. 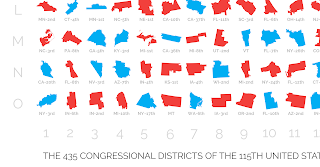 Alaska and Hawaii's 2nd District end up on the top row, when really they are just quirks of geography - nobody would claim they were heavily gerrymandered! So this is a limitation but a relatively minor one. Another thing that you might notice if you look closely is that some Districts might appear to be in the wrong place, based on what they look like. A good example of this is in Florida's 13th Congressional district, which is placed just before Wyoming as the second least irregularly shaped, even though it doesn't look right. But if we look at the portion of the boundary which could actually be modified through gerrymandering, given the coastline and the fact that this is St Petersburg (on a peninsula) it makes more sense. Wyoming does, thankfully, end up in the right place as the least irregular of all the shapes.